Effective for everyday personal hygienic use on outer rectal and vaginal areas. Cleanse the area by gently wiping, patting or blotting with pad to gently and thoroughly remove irritation-causing matter. Discard and repeat as needed. Freshens and cleanses the area, especially during menstrual periods. 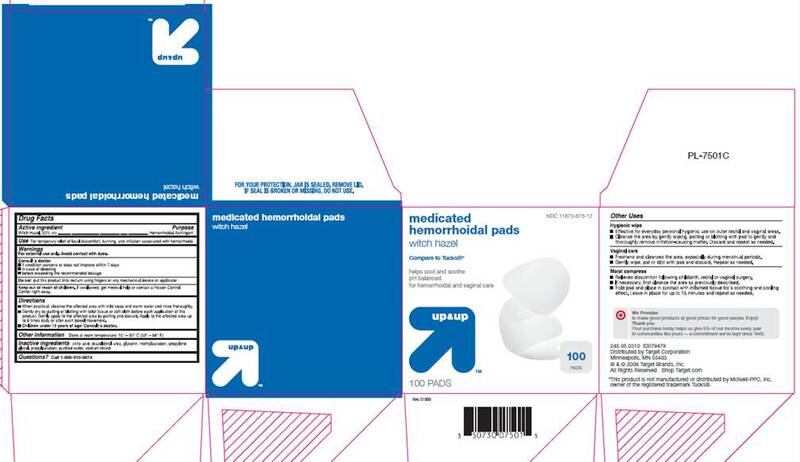 Gently wipe, pat or blot with pad and discard. Repeat as needed. Relieves discomfort following childbirth, rectal or vaginal surgery. If necessary, first cleanse the area as previously described. Fold pad and place in contact with inflamed tissue for a soothing and cooling effect. Leave in place for up to 15 minutes and repeat as needed. For vaginal care - cleanse the affected area by gently wiping, patting or blotting with pad and discard. Repeat as needed. FOR YOUR PROTECTION, JAR IS SEALED. REMOVE LID. IF IMPRINTED SEAL IS BROKEN OR MISSING, DO NOT USE. *This product is not manufactured or distributed by McNeill-PPC, Inc., owner of the registered trademark Tucks®.